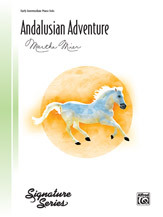 Enter the world of the Andalusian horse through this solo that creates a Spanish sound with flair. The moderately fast 4/4 tempo combined with a rhythmic, staccato theme sets the stage for an exciting performance. Written in F major, the syncopated melody found in the right hand uses a rhythmic pattern that is repeated throughout the piece, aiding in learning and memorizing. The harmonic intervals used in both the melody and the accompaniment make this solo an excellent study of intervals as well.